Bono crowd surfs in front of 500 people at the Roxy Theatre during "Vertigo"
Check out this crazy fan video of Bono briefly crowdsurfing as U2 perform "Vertigo" in front of 500 people at the Roxy Theatre in Los Angeles on May 28, 2015. For all of you Adam Clayton lovers, the fan who shot this video was literally inches away from Adam while he was playing the bass guitar. For more than three decades, U2's beloved tour manager, Dennis Sheehan, kept the band running on time. Sheehan died early Wednesday, just a few hours after U2 kicked off its latest tour. But promoters vowed the shows would go on in his memory, and they'd be on schedule. "Dennis always got the band on stage, pretty much on time. We're going to make sure we do that tonight, in his memory," Live Nation's Arthur Fogel said Wednesday. "It is absolutely what he would have wanted." Sheehan, in his late 60s, died at a Sunset Strip hotel in West Hollywood on Wednesday, a day after the band kicked off a five-night stint in the Los Angeles area. Continue reading U2's Longtime Tour Manager, Dennis Sheehan, Found Dead. For those whose stores of musical nostalgia and classic rock band decadence are running on fumes, this summer's concert season should be a welcome restorative. Last week U2 launched their iNNOCENCE + eXPERIENCE tour at Vancouver's Rogers Arena in support of their latest album and iTunes Trojan horse, Songs of Innocence. On 24 May, the Rolling Stones will land in San Diego to kick off their own North American tour. Titled the Zip Code tour, it's ostensibly a way to support their 9 June re-release of 1971's Sticky Fingers. That both bands are again battling for world tour supremacy is nothing new, but despite any similarities, the driving motivation behind each of these tours is remarkably different. Continue reading U2 and the Rolling Stones: rock giants hit the road but take different paths. 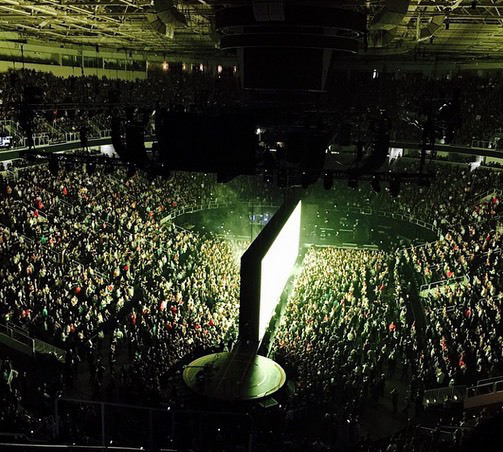 SAN JOSE, Calif. -- A U2 show comes with heightened expectations and an almost euphoric anticipation for a cultural touchstone. It's an impossibly high bar to meet. For more than two hours last night, the seminal Irish rock band did just that. A blistering start and finish book-ended a tech-tinged show that is bombastic, brilliantly absurd arena rock. From those setbacks, the venerable band saw the opportunity to turn uncertainty into a platform to redefine its place in rock 'n' roll's pantheon. Continue reading U2 tour review: Seeing is disbelieving. U2's Innocence + Experience tour nearly came to an extremely premature end at the end of opening night when the Edge took a nasty tumble into the audience, and on the second consecutive show at Vancouver's Rogers Arena Bono joined the many people on the Internet today cracking jokes about the incident. "Somebody said that the Edge had downloaded himself into the audience without asking permission," he said. "I thought that was great." Considering this was only the second show of a tour utilizing an incredibly complex stage and a ton of brand new songs, the group could have easily played it safe by replicating opening night, but they opted to mix it up. Here's eight ways in which it differed. They Honored B.B. King. It was a given that U2 would find a way to honor the blues legend since they recorded and toured together in the 1980s, becoming close friends in the process. It came fifteen songs in when they moved to the B stage. "This is a very special occasion for anyone who loves the blues," Bono told the crowd. "For this is the day that the world got to say goodbye to the great B.B. King. That is a special occasion indeed." They then played "When Loves Come To Town" for the first time in 23 years. Hearing the tune with Bono covering all of King's lines was a sad reminder that B.B. truly is gone. "Wow," Bono said at the end. "The thrill will never be gone." Continue reading U2 Honor B.B. King, Mock the Edge's Fall At Second Show. It was about 10 minutes past 8:00 p.m. when the lights dimmed at Vancouver's Rogers Arena and "Beat on the Brat" by the Ramones began blaring out of U2's massive sound system, kicking off the group's long-awaited Innocence + Experience Tour. As the band took the stage to a deafening roar from the sold-out crowd, they launched into "The Miracle (of Joey Ramone)" under a single light bulb suspended from the ceiling, meant to evoke Bono's childhood bedroom. The group that took a 29,000-square-foot stage known as the Spaceship around the globe on their last tour was now moving forward by going all the way back to where it began. They were honoring the music that first inspired them to pick up instruments, as well as the physical space where that happened. To drive the point home further, the song transitioned directly into "Out of Control," U2's debut single from 1980. "We're a band from the north side of Dublin called U2," Bono told the crowd, as if he'd traveled back in time. "This is our first single. Take it, the Edge." Not a single screen was activated, giving the crowd at the front of the general admission floor the sensation of seeing the band at tiny club in Dublin 35 years ago. Continue reading U2 Reinvent the Arena Show at Triumphant 'Innocence' Tour Opener. Too. Many. Jokes. (But we'll try to refrain.) U2 guitarist The Edge fell off, uh, the edge of the stage during the first show of the band's Innocence and Experience tour on Thursday night in Vancouver. The Edge -- aka Dave Evans -- was just walking along, playing the final song of the set, the classic "I Still Haven't Found What I'm Looking For," when suddenly, he wasn't on the stage anymore. Bono kept singing. Copyright © 2015 TheHuffingtonPost.com, Inc.
A SLUMBERING giant awoke last night near the snow-capped Grouse Mountains in Canada. Or to put it another way, U2 came back to the world stage last night in front of 20,000 fans at Rogers Arena in Vancouver. It was not quite the return of four all-conquering superheroes but more like four men who have been through the wars before coming out the other side... with a brilliant new album that got denigrated. The brilliance of the current Songs of Innocence album was obscured by the PR disaster that was the iTunes download debacle. "Divisive" wouldn't begin to describe it. So U2 had a lot to prove last night. Fail on this tour and U2 would be looking at a fatal loss of relevancy. Would Bono - after his dreadful accident in Central Park last November - be able to cut it as a performer? No longer jumping Jack Flash - more limping hack trash. No longer the young Dub who jumped down off the stage at Live Aid during Bad ... now a battered 55 year old man held together by surgical pins, like a rock-star Frankenstein. The answer to most of the above questions is, mercifully, that U2 - on the basis of what they did onstage last night in Canada - have no worries about the future. Continue reading Review: Barry Egan at U2's opening night of Innocence + Experience in Vancouver. If all goes according to plan, Patrick Stark will face his biggest fear Friday night and conquer it. The 47-year-old filmmaker and father of two is slated to join U2 on stage to complete a six-year-long documentary project that began at the Irish band's last visit in Vancouver in 2009, when he sang at a pre-show event he set up near BC Place, hoping to attract their attention. His idea was to confront his biggest fear -- singing on stage in public -- in one of the most intimidating settings possible. The end game was to sign with the band itself, on their stage. In fact, Stark has since been told by several U2 associates it would never happen. Continue reading Vancouver filmmaker hopes to join U2 on stage. The master of the megatour on U2's about-to-launch Innocence + Experience arena trek and why The Rolling Stones keep ticking: "That's the magic of our business." When a documentary in 2013 asked Who the F--- Is Arthur Fogel?, Bono answered: "The most important person in live music." Such fawning is to be expected from the U2 singer. After all, Fogel, 61, is the master of the megatour. His Toronto-based, 25-person team, backed by Live Nation's international network of promoters, ­producers, merchandisers and ­marketers, has seen tour grosses of more than $3.2 billion combined during the past decade, according to Billboard Boxscore -- among them, five of the top 10 biggest moneymaking treks ever, all steered by Fogel. A native of Ottawa, Ontario, Fogel got his start in music from behind a drum kit, then rose through the live-music ranks -- from booking nightclubs to arenas to stadiums, first in Canada and later around the globe. Titans of touring are his trademark; chief among them: U2, whose 360° outing grossed more than $736 million with attendance of 7.3 million over nearly three years (the band's more intimate Innocence + Experience Tour kicks off in Vancouver on May 14), along with The Rolling Stones, Pink Floyd, Neil Young and Rush. Continue reading Executive POV: Mega-Tour Svengali Arthur Fogel on Tackling U2 and Madonna, Ticket Pricing and Live Nation. Below are all three performances from U2 on The Tonight Show with Jimmy Fallon. The band played "Beautiful Day", an alternate version of "Song for Someone", and "Angel of Harlem" with The Roots. Additionally, U2 performed "California" just for the studio audience at NBC Studios at 30 Rockefeller Center in NYC. Travelers through New York City's Grand Central Station were treated to a surprise performance by U2 on Monday as the band recorded a segment for "The Tonight Show." Continue reading U2 Plays Surprise Show On NYC Subway Platform. The New York Times previews U2's "Innocence and Experience" tour in a lengthy article. U2 will guest on The Tonight Show on May 8th, nearly six months after a major bicycle accident forced Bono to cancel the band's weeklong residency on Jimmy Fallon's late night program. "You heard that right! U2 will be back on the show next Friday," The Tonight Show tweeted Friday night. U2 are currently listed as that episode's only guests according to the official Tonight Show site. Continue reading U2 Reschedule 'Tonight Show' Appearance.